Click map for links to the most recent warnings for your specific area. 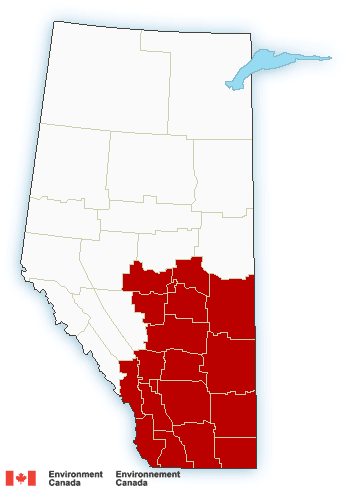 Wind warnings have been issued for most of southern Alberta. The strongest winds will be near Pincher Creek with gusts up to 130 km/h. An intense low is forecast to develop over western Alberta Tuesday tracking into Saskatchewan Tuesday night. The low will bring strong winds to the southern foothills tonight spreading eastwards Tuesday. Northwesterly winds will develop in central Alberta Tuesday afternoon. Wind gusts near 90 km/h are expected. The strongest winds will be near Pincher Creek with gusts up to 130 km/h. Winds will diminish Tuesday night. Please continue to monitor alerts and forecasts issued by Environment Canada. To report severe weather, send an email to ec.storm.ec@canada.ca or tweet reports using #ABStorm.